Indian Americans are known for a great many things -- business acumen, success in the medical profession, being the backbone of Silicon Valley. But humour? Do funny desis really exist? Isn't Russell Peters -- the Anglo-Indian stand-up comic from Ontario -- the only one? No, he isn't. In a series of portraits, rediff.com introduces you to the funny men and women who comprise the funny bone of the Indian-American community. Here's a peek at the work of Dan Nainan. He is a former techie who took a class to overcome his fear of public speaking, then quit his job to embrace and pursue his newfound passion. For over six years, Dan Nainan has done stand-up comedy across the country and before celebrities like Hillary Clinton, Howard Dean and Cherie Blair. He can mimic George Bush and Bill Clinton; he can also do British, Dutch, French and Indian accents. Nainan, whose father is Indian and mother Japanese, often employs his mixed heritage to stir up the crowd. "People tell me: your dad is from India and your mom is in Japan, so that makes you half Asian," he says, sending the audience into guffaws. "What continent do they think India is in, Antarctica? You know what it took for Americans to realise where India is? A tsunami!" In the next few months, the New York-based comedian will travel to California, Florida, Washington, DC, Georgia, and Ohio to participate in events that run the gamut from South Asian charity galas and comedy club shows to corporate events and private parties. About half his performances take place before South Asian audiences. "They are my favourite because they receive my material the best," he says. Nainan, who looks more Indian than Japanese, has performed before the East Asian community too, but feels that crowd could be a little uptight. "Whereas South Asians have a great sense of humor," he says. "They are great at laughing at themselves." As a senior engineer at Intel in the Bay Area, Nainan was required to carry out highly technical demonstrations on stage, at times in front of thousands. "I was really nervous about speaking, and took a class," he says. The next year, 1999, at a team dinner for 200 people, his jokes about Bill Clinton and imitation of Intel CEO Andy Grove had everyone in splits. He was asked to perform at the sales conference in front of 2,500 people. At the event, those who didn't know Nainan thought a professional comedian had been hired. "I thought, maybe I can do it full time." 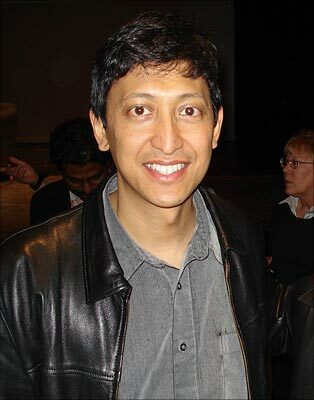 Nainan believes in comedy that is clean, like Jerry Seinfeld's, whose self-titled sitcom became a runaway success. "If you do dirty stuff, you are cutting out 40 to 60 per cent of the audience," he says. People have told him his comedy is similar to Ray Romano's, whose family in the series Everybody Loves Raymond with a nagging wife and intrusive mother has a striking similarity to the Indian family system. Nainan, who is a voracious reader and doesn't own a television set, hasn't watched the sitcom though. His comedy is more of a monologue than an interactive act. And that, he says, safeguards against hecklers. Another way to avoid heckling is to make sure it's really funny. "Bam, bam, laugh every 10 seconds," he says. "This is the MTV generation. People have a really short attention span." Comedy is in some ways mathematical, says Nainan, who is an early riser despite being in the business of entertainment, perhaps a habit acquired from his days at Intel. "You can reach me anytime from 7 am to midnight, seven days a week," he wrote, in reply to an interview request. He says those who succeed in this business also have a sense of good timing and rhythm. "You talk; the audience laughs. You talk, they laugh," he says. "Just before they stop laughing, you come back again." Speaking of rhythm, Nainan plays six instruments. He began training in classical piano when he was 2, then took up the guitar and toured with a rock band in California. He also plays bass and drums, and for the last couple of years, has been playing the cello. Does he ever regret choosing life as a comedian? Not at all, except that he wants to be musician and, once in a while, dreams about being back at Intel. "I loved Information Technology," he says. "But if I hadn't gone off and tried to do something creative, I would have regretted it." Everyone has their own group to hang out with. I live in New York, and you've got the Irish parade, the Puerto Rican day parade, the gay parade, the gay Puerto Rican day parade -- but there will never be an Indian Japanese parade. In fact, in my whole life, I've only met one other person with the same racial mix as myself -- my sister.